I'm a work-at-home breastfeeding mom who directly breastfeeds my little Kali. I have 2 manual pumps Medela and Avent Classic, yet I have dreamed of getting an double electric breast pump for convenience. Most of the electric pumps from well-known brands out there are outrageously expensive. They retail for at least Php15k and up. I chanced upon Babymama's website and I am so thankful that she has a wide selection of good, hardworking electric breast pumps. Best of all, they're AFFORDABLE! You can find a double electric breast pump for as low as Php4,900. Amazing, di ba? My husband asked me what I wanted for Christmas and without a doubt, I told him, "I want a Spectra M1 Double Electric Breast Pump!" He was a bit skeptical at first because the pump was so much cheaper than Medela and Avent, but I assured him that it had good reviews. Besides, I wouldn't want to invest so much in an electric pump that I don't use frequently every day. Since I'm a work-at-home mom, I can conveniently breastfeed my baby directly and take a break from work easily. I pump to build my breast milk stash for times when I have to go out for meetings or errands. 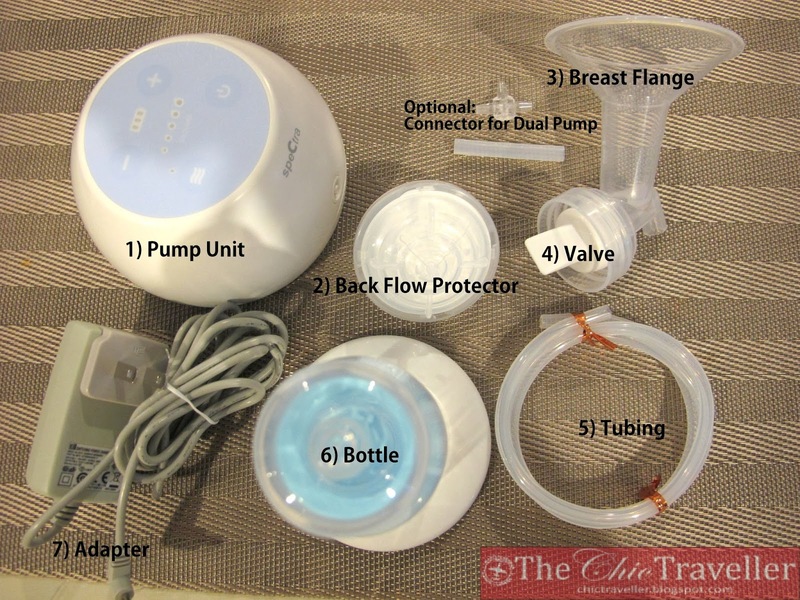 Before Christmas, my Spectra M1 breast pump arrived and I was eager to try it. Babymama threw in a lot of freebies like Mother's Milk tea, Nano Silver Ice Pack and a few other items. (--Thank you Babymama!). Before I give my review, let me introduce to you the pump and show you how it works. There are exactly 7 important parts to remember: (1) Pump Unit, (2) Back Flow Protector, (3) Flange, (4) Valve, (5) Tubing, (6) Bottle and (7) Adapter. This is for one set. If you want to use it as dual pump, you need to use the connector and attach another set. The Pump Unit controls. There's the On/Off button (lower right), Battery Indicator (top center), Massage Mode (lower left) and +/- Buttons for the vacuum adjustment (top left and top right). The middle indicates the vacuum setting. This is what it looks like when you put it on massage mode. Just look for the orange light. Massage encourages let-down, and once you see milk come in you can switch to the actual milk expression phase. Actual expression phase. I use the middle setting (3/5) since the vacuum is just right for me. Feel free to experiment which vacuum setting is hiyang for you. I've read that some moms just use the massage mode. Easy Assembly. My yaya can assemble it like a pro when she sterilizes it for me even without reading the manual. Efficient Let-down. There are times when I use my Avent and Medela manual pumps and let-down is difficult. Sometimes I think that I have no more milk flowing. With Spectra M1 massage function, let-down is easy and I am assured that there's always milk to collect. Affordable. Seriously, who can get a better deal than a mere Php7,800 for a good breast pump? It's half the price of most popular breast pumps out in the market! Quiet. I can breast pump while my husband and baby is sleeping and they wouldn't even notice. I breast pump and multitask and I don't even mind the sound. Pain-free. With the efficient let-down described above, I find that this pump is absolutely pain-free. The first time I used it, I didn't notice that there was already milk flowing! Make sure that you use the right vacuum setting for you. I tried to increase the setting one time to see if more milk will flow, but naging mas masakit lang ang vacuum. Portable. The pump unit is the bulkiest part of the breast pump, and it is smaller than a tall order of your favorite Starbucks drink. It can easily be stashed away in a small insulated bag. I can imagine that it's super easy to bring for corporate moms out there. When I first opened Spectra M1, I wasn't impressed since the plastic parts seem to be thinner than my other breast pumps. But when I finally tried it, I am amazed by its efficiency! It's a hardworking, affordable, convenient electric breast pump. What more could you possibly ask for? Feel free to visit Babymama's site for more details and browse for other Spectra products.